The photo was taken by an unknown person on 9-26-06. 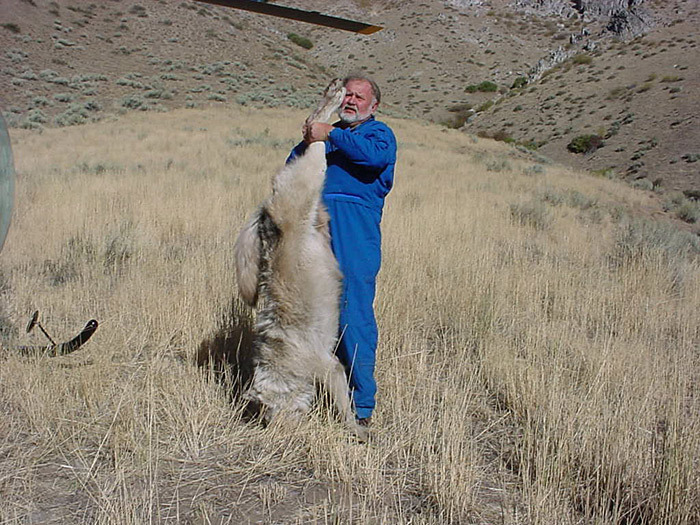 These wolves were shot from the air in Danskin Mountains, a vast rugged area of low, steep mountains NE of Boise. I could never found out what these wolves supposedly did, although in August 2006 Ed Bangs reported “On the 15th, an ID WS aircrew spotted one black adult wolf and two pups on a calf carcass on Danskin Ridge. Wolf control for livestock has deteriorated in recent years. They used to try to remove the offending wolf. Now they just kill a few wolves in the area if they can find some — vengeance killing. There is a rumor that their new informal protocol is to kill two wolves for every head of livestock killed, even day old cow calves and lambs. Chuck Carpenter is the district supervisor for central Idaho for the U.S. Wildlife Services. Jared L. Hedelius conducts predator control activities for U.S. Wildlife Services in the Fairfield, Featherville, and other portions of south and southwestern Idaho. I think that the history of the Buffalo Ridge pack demonstrates this contention quite well. Essentially 4 wolves have been killed (one hit on the road) for the deaths or 2 calves (one a 2-day-old calf that could not possibly have enough left to determine whether it was killed by wolves or died from the cold) and there is an order to kill one more. Apparently it’s not enough to kill just one wolf for a couple of calves but 4, and 5 if you don’t count one because it wasn’t killed by WS. This pack is about as good of a pack as you could ask for in an area where there is livestock and has a very good history over the long term. These are revenge killings Mr. Nadeau and killing them for such insufficient reasons makes it more likely that you will have a more troublesome pack take its place. This is precisely why IDFG should not be trusted to manage wolves with the policy that is proposed. You may as well let the Cattlemen’s Association manage them because that is what you have now. In conversation I was told that WS agents are evaluated by the ranchers. Is this true? If so then this is a good indication that WS is going to implicate non-wolf predation on wolves so that the rancher, who is standing over the shoulder of the WS agent, will get his Defenders pay-off. What happened to non-lethal techniques which have been shown to be effective? Too effective? Doesn’t give the WS the excuse to wantonly kill wildlife for no reason? I guess they don’t want to come up with acceptable policy even if you hand them effective ways to avoid conflict. Get rid of their funding or change their mission to controlling invasive species such as New Zealand Mud Snails or invasive species of cattle and sheep. That would be a more sensible mission. On the 6th, ID WS confirmed that wolves killed a 2-day old calf on private land east of Clayton. Efforts are underway to remove up to 2 wolves. An IDFG Conservation Officer reported he’d received a phone call on 12/8 from a local outfitter who reported hitting a wolf on the highway near the East Fork Salmon River. The outfitter said it appeared the wolf had a broken back. The CO couldn’t find a carcass that morning, but returned later during daylight and found evidence in the snow indicating the animal had dragged itself down to the river, where he lost the trail. The CO received a report early the next week of someone seeing a dead wolf in the river. On the 16th, an ID WS aircrew found 8 members (4 gray/4 black) of the Buffalo Ridge pack in the open. This pack was implicated in a confirmed livestock depredation on a calf about 10 days earlier. The aircrew was able to shoot and kill one gray wolf as the pack was heading into the timber. The wolf was on a finger ridge on the Thompson Creek Drainage in the Salmon/Challis National Forest near Clayton, ID. Control On the 22nd , an ID WS aircrew shot and killed a gray wolf from the Buffalo Ridge pack. This control action took place on the in the Salmon/Challis National Forest near Clayton, ID. This removal completes the control action that began about 3 weeks ago after these wolves killed a calf. On the 16th, a ID WS aircrew was able to shoot and kill a gray wolf from the Buffalo Ridge pack along the East Fork of the Salmon River near Clayton. This pack has been implicated in several depredations on cattle over the last few months. Who “owns” these wolves in Idaho, Montana and Wyoming – all the people of Idaho, Montana and Wyoming or just private livestock producers and/or hunters/outfitters? Which owners have a real and effective voice in the management of these wolves, all the people of Idaho, Montana and Wyoming or just private livestock producers and/or hunters/outfitters? On whose land were these wolves found and killed – private or public land – American’s lands? Were these wolves found and killed on America’s National Forests – public land that belongs to all Americans, not just livestock producers and/or hunters/outfitters in Idaho, Montana and Wyoming? Wildlife Services is a federal agency? And this federal agency is killing wolves on behalf of private livestock producers and/or hunters/outfitters? And these private livestock producers contribute only a small percentage to the world markets they target? And the latest U.S. Fish and Wildlife Service study ( http://federalasst.fws.gov/surveys/surveys.html ) indicates that the numbers of hunters are in serious decline? And some outfitters charge what, some $5,000+ a week to haul their customers onto America’s public lands so they can “harvest” their big game? Unless I’m mistaken, wolves that belong to the people of Idaho, Montana and Wyoming are killed on America’s public lands by a federal agency on behalf of private livestock producers and/or hunters/outfitters. Oh, don’t forget the photo’s and video of the wolves killed last spring near Picabo. One was a disperser from the Buffalo Ridge Pack. And if the Idaho Woolgrower’s, who have Butch Otter’s ear, have their way – we will soon see Wildlife Services, ISDA, or someone, aerially gunning bighorn sheep that stray into Woolgrower-imposed Eradication Zones. They are seeking to impose Bighorn Kill Zones in Idaho. Folks may recall that Mike Crapo’s “Environmental Liaison” in Idaho for a couple of recent years, including during the Owyhee Initiative giveaway to the public lands ranchers, went right from being a Wildlife Services killer and trapper to “liaisoning” on the envt. Shows the disdain Crapo, like Larry Craig, really holds for the environment. ALSO pasted below is yesterday’s Press Release from IDFG – seems the number of Idaho Wolf Packs is quickly SHRINKING …. I wonder if there can be any relation to activities like the gloating slaughter pictured here? A news release about the Idaho Fish and Game Commission, which met Thursday, January 17, included unclear information from a summary of the Idaho Wolf Population Management Plan. The summary included the estimated number of wolf breeding pairs, 63, which is different than the verified number that we report annually. The official number of breeding pairs for Idaho for 2007 is 43. A breeding pair is defined as two adults that produce two pups that survive until December 31. It is the measuring stick the U.S. Fish and Wildlife Service uses to determine the reproductive capacity of the population, and it is tied directly to criteria for removing wolves from the endangered species list, and consequently re-listing. For the past 12 years, Idaho, Montana, Wyoming, Indian tribes, and the Fish and Wildlife Service have been using the minimum verified breeding pair number. We dun got us sum wolves! Squeal like a pig boy! SQUEEEEEEAL! I was waiting to find out who the Wildlife Services agents were before I posted them. WS tries to be very secretive. Too much of the government has become that way . . . so in the interest of openness, I wanted the names. isn’t any predators. problem solved. Check out the 3 pictures at the bottom of the photo page on the AGRO site. Shows WS agents posing with their kills near Polaris, Mt. We have the same low-life WS agents here in Montana as you have in Idaho and Wyoming. Folks might want to send them to newspapers or magazines like Time, Newsweek. They could end up some where interesting. I don’t know the probability. Ralph – I agree with you posting them. They are public employees holding the public’s wildlife, after all. Thank you. Anyone have contacts with any of these magazines? I can’t help but wonder why Defenders doesn’t make an issue of this. Like someone posted , it’s time they put their $$$ into a campaign like this instead of reimbursing the friggin cow growers for lost cows. Come on Defenders…you’ve got the money, including mine, to make this happen. Lethal control of wolves, aimed at removing the offending animal(s) AND conducted within a reasonable distance from the documented depredations site can be effective. This should be done after non-lethal methods have been exhausted (as stated in the Final Rule). I believe at least one of the Buffalo Ridge wolves was “taken” many miles from the dead calf. Too often these days there is no attempt at deterrence and Wildlife Services homes in on the nearest known radio-collared wolf and lays the blame on it or its companions. A couple things about Defenders. They will not be reimbursing when the states take over. Because Wildlife Services is getting sloppy and calling many things wolf kills now that in the past they said were not or were of undetermined origin, Defenders is rejecting many of the claims. Defenders is running a campaign in the Metro in Washington, see my story about it. I think this is a very efficient use of money. Defenders saw these photos for the first today (from me). I hope that Defenders didn’t compensate for the alleged kills of the Buffalo Ridge Pack and I hope they do due diligence with the particular agent who confirmed the kills as well. I don’t want to be too hard on Defenders but I think it’s time for them to stop making payments on depredations that result in the killing of wolves anyway. Yes ranchers have had a free ride long enough, there is a rancher over by Carey that was letting his cattle graze right down into silver creek, do you think anything happened to him….nope. So if they are going to raise cattle and sheep in wolf country they need to be prepared to accept the responsibility that they are going to lose some animals to wolves. Its high time to stop being politicly correct and do the right thing. So the ranchers that got payments for animals killed by wolves, did they also right off the loss on their taxes???? So that would be like getting paid for the animal twice. I know Jared (pictured in the second photo) and can tell you that he is not . . . . . deleted by webmaster. in fact, he is knowledgeable and concerned about wildlife. He worked for some time at the coyote research facility near Logan, UT as one of the animal caretakers, and was always compassionate. Photos are tricky. They are worth “a thousand words,” as the saying goes; the problem is, everyone inserts their own text. As I have mentioned before, many of the people who are employed by WS care deeply about wildlife (many, not all). Many would be happy if their jobs involved non-lethal methods, but they are not the one’s making decisions. I would also point out that they pay these people next to nothing, but most come back because they love working with wildlife. I agree that much needs to change about WS (especially the culture), but please focus your anger on those who deserve it–those who give the orders. I’m with Chuck and the rest of you on the idea that WS is just a “hit squad” for the ag community. It’s time this special treatment stopped. That’s what lured those welfare ranchers to this region in the first place, elimination of predators so they could pretend that they were profitable operations at taxpayer expense. There isn’t really a cost-benefit analysis that shows that these operations would make a dime if they didn’t have the government hit squads and subsidies keeping the parts of nature they don’t like away from them. If they had to live with all of nature, which they claim to be “stewards” of, they would be someplace else. Kind of like the Yelllowstone bison, if you don’t want them walking in your yard, there’s just about every place else on the planet to build your trophy home/ranch and not have that as a “problem”. If the ranching community was serious about their profits, they wouldn’t be out here where there isn’t enough forage for their domestic animals. They use public lands for dirt cheap fees and desecrate the landscape because the gov’t lets them. If the ranching crowd were realistic in the least, they would know that if they don’t have a yard big enough for their animals, they shouldn’t have those animals, or go someplace where they can have a yard big enough for them without stealing our lands from us. Somehow this fails the “democracy test’ in a big way. I don’t think (my informed speculation) they are going to compensate for the Buffalo Ridge supposed kills. The pack was not near the area when the kills took place. The kill or kills was of one or two day old cattle. Some other wolves might have done it or fed on the calves (which could have been stillborn or dead of natural causes like harsh weather). The rancher who is renting the pasture knows there are wolves in the area. This particular pasture has been a place where many wolves have been killed, dating back to the 1990s. Once again, it’s any wolves will do with no effort to find the likely wolf, just the easiest. This is taking place after years of developing non-lethal methods of keeping wolves and livestock apart. Wildlife Services and Steve Nadeau don’t seem to care, just shoot them and go back to 1921. If they want to abandon 12 years of progress, they are going to pay. jb…..they can always say “no” and they don’t have to take those jobs, especially as you say”they love working with wildlife”. I’m sure there are other jobs related to wildlife that doesn’t involve killing them if they desire employment. 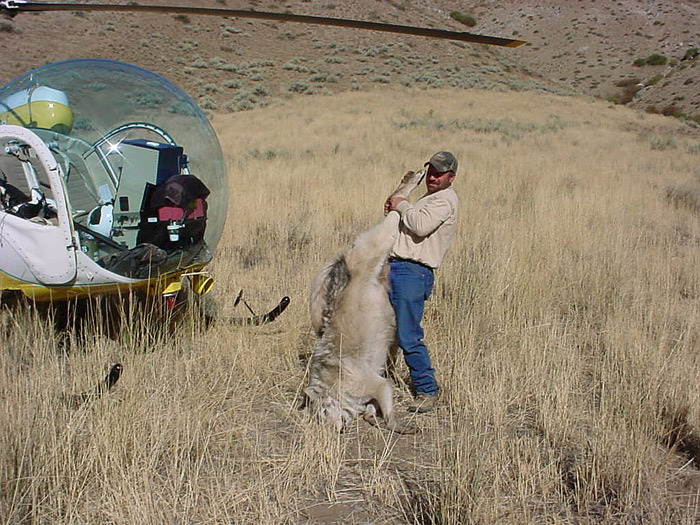 Wildlife Services mode of operation is to use two aircraft when killing wolves. They use a spotter plane overhead with a radio receiver pinpointing any radio-collared wolves, while the shooter in a helicopter uses a 10 gauge shotgun with #4 shot. The shooter is most often the so-called wolf specialist. The last wolf targeted is the one with a radio-collar. I watched them in action near McCall a few years ago when they took out an entire pack. They have a very difficult time finding the wolves if they are not collared. Do everything you can to keep collars off of the wolves. Well meaning wolf advocates donate money for radio-collars, thinking they are helping with wolf research. A radio-collared wolf is a dead wolf. A wolf pack with a radio-collared member is a dead wolf pack. the real question that remains in my mind is whether WS will receive a new mandate such that the folk JB mentions can be proud of their new work (pulling invasive mollusks out of stream-bottoms ? as was suggested before) – rather than obliged – whether enthusiastic or not – to slaughter wolves in such a despicable way on the federal dole. Ralph… The “original” heading to the story was…”Wildlife Services doing their DIRTY work. I’d say that was more appropriate. Jerry b… I am not so sure that they can always say no and take a different job. Where I live those who do these jobs find that much of their work is worthwhile and sometimes they have to do ugly things. . but the bottom line is that they don’t earn enough to be in a position to look for a new job. Most of them are stuck by life and/or circumstances. In most rural areas there are not other jobs to be had. When you are young and you have a choice people choose to go into these fields because they like working outdoors and are interested in wildlife. . the young ones usually get the field work and then by the time they have wisdom they are behind a desk, stuck with a mortgage and family who all need health insurance and a retirement fund and then they are asked to make stupid decisions. It is not a good system. Wow, that is like telling starving Ethopians – so you have a drought, just move. If the drought spreads, move again. When the drought covers an entire continent, problem solved! I think the wolves will find Anna delicious as she gurgles problem solved! I second all the questions brought up by Mack Bray in his posting. I am also curious if anyone knows if the owner of the calf was paid for his loss. If he was compensated then I don’t see why there’s any need to then go out and shoot 2 or 3 wolves. This is all just very sickening to me. Actually, there are very few jobs that allow people to work in close contact with wildlife. This situation exists for a number of reasons. Many of the jobs working with wildlife at state agencies were initially filled with baby boomers; because these jobs are coveted and agencies don’t offer much of a chance to “move up the ladder,” a lot of these individuals still occupy the same position. We’re told that the boomers are poised to start retiring, but given how chronically underpaid agency employees are, and the condition of the economy, I suspect most will choose to work as many years as they can. Moreover, because funding for state agencies is decreasing with the sale of hunting and fishing licenses, when people do retire many positions are left vacant. The Federal system may actually be worse. You may recall that a short time back the Bush Administration reduced FWS budget such that they started eliminating many (I think up to 1/3?) of positions at National Wildlife Refuges. As to whether there “are other jobs related to wildlife that doesn’t involve killing them…” I guess that depends on what you mean by “related.” You could make the argument that anyone that works for an agency has a job “related to wildlife,” however, I don’t think people trained in wildlife science are looking for desk jobs (thought that’s what most of them get anyway). Frankly, I can’t think of anyone that works–on the ground–with wildlife that hasn’t had to kill an animal at some point. Birds get injured in researchers nets, animals in zoos get sick and are euthanized, deer managers are called in to thin herds in urban areas, etc. I know one long-time WS agent whose job it was to kill problem coyotes (those that were eating some ranchers sheep). He spoke about coyotes with absolute reverence. He, like many hunters, loved the animals he killed. This mindset is not easily understood by people today, and I don’t have a good way to explain it. At any rate, my point is that these people are not monsters, as some make them out to be. They are simply a product of a system that places the interests of livestock growers above the interests of the general public. The point JB makes about the system is well taken. It is an oligarchical system put into place by ranchers more than a century ago to control land use policy, and they are doing everything possible now to maintain the illegitimate privileges their ancestors created for them. Our greatest task is to go after the system. The best way to do this is to go after the subsidies (predator control, damage compensation payments, elk feedgrounds, etc). But the collaboration and consensus nonsense will have to stop first. Rancher aren’t going to agree to give up their privileges. For the record, the Wildlife Services person in Challis (nearest town to where the supposed depredations by Buffalo Ridge Pack occurred in December)is Eric Simonson. Everything I’ve heard on the street and elsewhere in Challis and Clayton says that Eric is not one of those agents “who loves” the wolves he kills. Just the opposite. That IDFG goes along is very unfortunate and a lot more wolves are going to die in Central idaho because of it. But when the governor and legislature don’t like wolves and want all but 150 of them killed by any means possible, well, you kill wolves or lose your job. Like Ralph says, we seem to be losing 12 years of proactive, non-lethal efforts and going back to 1912. Maybe continued publicity, more photos, more outcry from the public might help. Also, there are some cattle and sheep people who are willing to live with wolves and I applaud them. Let’s be careful not to alienate the few friends that wolves do have in industry. Lynne…check out this link. Ranchers in Oregon are filing a lawsuit against WS and the State over the pending lion hunt that would result in 2000 dead lions. You mentioned “there are some cattle and sheep people who are willing to live with wolves” in Idaho. Think there’s any chance they would form a group to fight the wolf “harvest”, or would the intimidation factor be too much? Anna’s comment is NOT like telling starving Ethiopians to move if they don’t like their drought. Starving Ethiopians have no choice. Ranching in the Rocky Mountian West, is simply bad business, econimically and environmentally and only exists because of tax- paid subsidies and practically free public lands grazing at the expense of the ecosystems and wildlife. It is monopolizing and exploitation of publicly owned lands and wildlife to profit private interest. Other areas of the country are far better suited for raising cattle. Ranching in the west makes as much sense as running a fish hatchery in shark invested waters and expecting someone else to pay for your losses. What is the area code for the numbers you provided? Cat, Idaho area code is 208; state-wide, I think. Maybe if a few more crash and burn they’ll quit. I am not going to second-guess any of the conservation groups, but I see this as a golden opportunity to stay this action in federal court. Let’s see what happens in the next few days. In years past, Wildlife Services have attended the conference. Given the atmosphere on this subject, would it be appropriate to exclude WS from attending this years conference? Rick – I would say more than ever, Wildlife Services should attend. That WS representatives in administration and on the ground be there. We need more dialogue, not less. Similarly, IDFG managers and biologists should attend. And I’m going to try and go to this meeting for the first time! There were only 2 confirmed depredations but given all the conditions it was known that the only thing to eat was livestock (on an allotment that usually loses 2 calves 15 were missing) The depredations occured on high sagebrush steppes within 20 ft of a road. My understanding is the picture was taken as documentation that the control action was complete. We have ranched in this area for 50 years, we live with bears, cougars, coyotes, and wolves (which generally thrive on our private land) With bears in our yard and cats living with our daughters 4h sheep we had never lost an animal until wolves came. I confess I don’t know the Danskins, although I was told yesterday they are full of elk, Perhaps the truth is both are true — there are a lot of elk, but the distribution is not uniform? I simpathize with the fact that your daughter lost her 4 H sheep. However your statement that you never lost an animal until wolves came is misleading. The fact is that wolves were present historically, then ranchers with their cattle and sheep came, wolves were extirpated, and then wolves came back. Can you not concede that it was in fact, livestock that invaded the wolves natural habitat. I question how wise it is to have sheep in known wolf habitat without taking proper measures to insure their safety, i.e. guard dogs or proper fencing or keeping your animals in sheds at night. Can you understand that the wolf’s contribution to it’s ecosystem and what that means for the health of our forests and wildlife populations might be more important to the welfare of the planet and all of it’s inhabitants than the loss of a few sheep or cattle means to a very small minority of the population? Those who insist on maintaining their livestock in wolf habitat should be prepared to accept their losses or put out a little extra effort in protecting them without jeopardizing an endangered speicies. The existance of this endangered species simply is more important to the planet than are a few domestic sheep or cattle. Sometimes our lives take different directions than we had planned and we must look for other means of support. This happens to all of us. The desire of a few to maintain a way of life that negatively impacts the natural world especially in the few remaining places that can support the nation’s wildlife is outweighed by the contribution that that wildlife (including and especially wolves) makes to the planet on so many levels. In addition there are programs available to you at little or no cost that can help deter predation nonlethally. Guard dog, and range rider programs through certain wildlife orgs are some of them. You misunderstood, I never lost sheep even when cougars were in the same pasture. I’m not sure why cattle have become such a demon in some peoples minds. As I stated, my cattle run in a heavily recreated area with little game as a result. The elk are above this area in the summer and come down onto my private ground in the winter. Cattle can be harmful to the environment if they are not managed correctly, just as wildlife can. They can also be a useful tool to reduce fuel loads (cattle elk and deer eat different plants at different times of the year). Grass is a renewable resource that grows back year after year. You are correct during the winter there are several thousand head that winter on the private and BLM land between the mountains and the freeway, they migrate back to the higher elevations in the spring. Just an observation, but prior to wolf reintroduction there were only small herds of 5 to 10 totaling around 100 hd in the winter. On the 23rd, ID WS investigated a report that wolves killed a pair of ewes on private land south of Riggins, ID. There was not enough evidence left to confirm the depredation, but ID WS did determine that it was “probable”.